Successfully Added SATA Hard Drive Docking Station - External HDD Docking Station to your Shopping Cart. 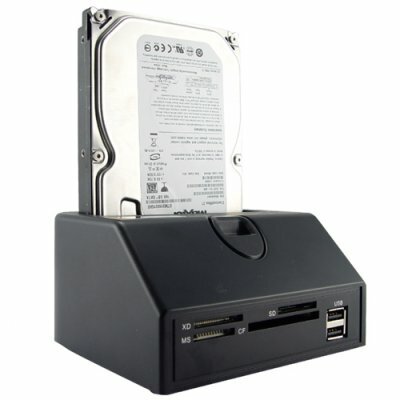 SATA hard drive docking station with multi-format card reader and USB hub built-in. Now you can instantly add an HDD to your system and even hot-swap multiple drives. How does it work? Simply place your 2.5 or 3.5 inch SATA hard drive into the docking station and you're ready to go. Yes, it is as simple as that! Now there is no need to open up your computer and adjust your computer setting to add an additional HDD to your system. Yes, now you can finally add an additional hard disk to your computer just as easily as you can with an SD card or USB thumb drive! Better still, this unit also includes multi-format memory card and USB slots so you can also use this unit to copy files in between multiple types of storage devices. We all need more storage space, right? Whether for your home or office computer, this SATA HDD docking station makes it easy to simple add the additional disk space you need. SATA hard drives are the cheapest (per GB) and fastest storage medium available today. For the price you would pay for a 64GB USB flash drive you can buy a 500GB SATA HDD. That is almost 10x as much space for the same price! Backing up your computer data is crucial these days, losing the family digital pictures and personal music + video collection would be a huge loss. While it may have been difficult to easily backup everything in the past, now you can add up to 1TB without having to even lift up a screwdriver! Don't wait any longer to add extra storage space to your computer. A great product to offer on the computer accessories market. With the tightening economy we all know it is much more economical to upgrade a current computer versus buying a new one, so buy one of these new computer accessories for yourself and then stock up on some additional units to sell at your online / physical store or feature it in your latest eBay, Amazon or uBid listings and use our blind dropshipping service to maximize your limited resource of time. SATA hard drive docking station. As easy to to use as an SD card or USB thumb drive. Need an all-in-one card reader for your collection of old and new compact flash, SD, MS, etc. card types? Now you have an a single hub to read them all. In addition, it also has two frontside USB 2.0 ports. What is this SATA HDD docking station made of? Heavy gauge molded plastic. It has four rubberized feet to keep it securely placed on your desktop. Can I get it in any other colors? No, it is only available in black. Can I use this model with my Linux computer? Not as we tested it. If you are an experienced Linux user you may be able to find software to help connect this unit with your computer, however we do not guarantee compatibility with any particular Linux distributions. I have got rid of a few computers but I have always kept the hard drive (privacy reasons). I saw this and thought it might be a handy device to have. I WAS RIGHT. I have doubled the size of my computer memory for a fraction of the cost or effort of going to a computer store, and I have been able to gain access to photos and documents I thought I had lost. I like the dual dock idea, but this lets me keep one HDD in the dock all the time and I keep another, with personal files, locked up. Anyone can look at my computers, there is nothing there that might be "private"...those files are all safely hidden on a seperate hard drive, and I can access those files through the dock. Fantastic, useful and cheap, and delivery wasn't too bad. It works properly. It's a card reader/writer plus Hdd reader/writer! I use it several times when I need to get backup from my friends' desktops. on 2009-06-19 04:50:29 very functional! there is no problem in installing this item and get some sata-drive in function. good job!